Ever since I noshed on hearty falafels, creamy tzatziki, warm pita bread, and nutty tahini in Helsinki (recap post coming soon! ), I've been craving Mediterranean food. But, let's be honest. I crave Mediterranean food most days of the week. Falafels are one of my absolute favorites. Fried, bread-y chickpeas doused in minty tzatziki sauce? Sign me UP. However, unless you're buying falafels pre-made, they can be pretty laborious. They're worth the effort, of course, but I wasn't in the mood to dirty up my food processor yesterday. The next best thing I could think of? Socca. 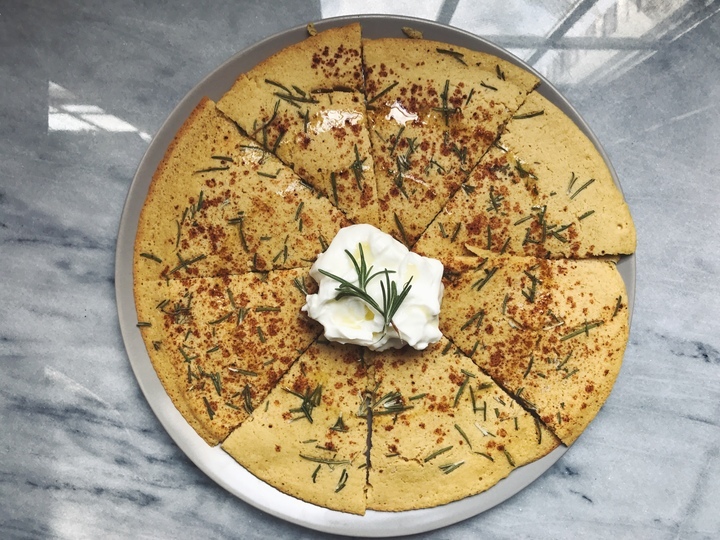 Native to the south of France, socca is a traditional, versatile flatbread. The ingredients are simple at best: chickpea (garbanzo bean) flour, water, high-quality olive oil, and sea salt. That's it. But, I love fresh rosemary. It's one of my go-to herbs. So, I couldn't resist adding a bit of chopped rosemary (and smoked paprika!) to the socca batter. If you haven't cooked or baked with chickpea flour, it's full of protein and fiber, but it doesn't contain gluten proteins. So, it's naturally gluten-free. That said, it needs more time to hydrate, which is why this recipe requires a 30-minute "rest" period. This gave me just enough time to throw in the laundry, scroll through Instagram, and change Spotify stations. Once it's done baking, expect a nutty, bean-y taste with a delightful rosemary aroma. After it cooled for a few minutes, I cut it into equal slices and re-plated it. For something extra, I added a dollop of yogurt, more olive oil, and extra rosemary (for garnish). But, you can add any sort of sauce on top. I would suggest tzatziki, hummus, pesto, etc. Otherwise, just a drizzle of high-quality olive oil will do. I had a few pieces with lunch, and then stuck the rest in the fridge. It will last, covered, for about a week. To reheat, just add any leftovers to a warmed skillet and fry in avocado oil for a few minutes. Shoutout to the Kitchn for the inspiration! 1. Add your flour, water, sea salt, and olive oil to a bowl. Whisk together. Let it sit for 30 minutes on the counter, uncovered. 2. After 15-20 minutes, turn on your oven to the broiler setting (500 degrees Fahrenheit). Once it's hot, stick your skillet / pan into the oven. Let your skillet / pan warm up for about 5-10 minutes. 3. Once your batter has "rested" for 30 minutes, take out your skillet. Spray some avocado oil on it. Pour in the batter. Add your chopped rosemary, smoked paprika, and another pinch of sea salt to the top. Stick your skillet back in the oven. 4. Bake the socca for 6-8 minutes on the broiler setting. Take it out, let it cool, and add your yogurt, olive oil, etc. Enjoy!